Rumors on the Internets is always looking to expand our reach across the cyber realms, and today we welcome our first-ever guest contributor. DB is an expert on the Academy Awards. Heed his wisdom and you might learn something. It’s been over a week since the nominations were announced and I can’t believe it’s taken me this long to shoot off my reactions. I’ve been too busy writing about Lost. And running my meth lab. So for those who might care, here are my thoughts – where I have some – on what made the cut. So the highly anticipated “10 Best Picture nominees” cat is out of the bag, and all in all I’d say it’s a good list. Like a lot of people – most people, probably – the nomination for The Blind Side caught me way off guard. When the trailers for this movie ran last fall, I thought it looked sentimental and cheesy, and even if it was a true story, I was still turned off by a movie about rich white people coming to the rescue of a poor black boy. Which is weird, ’cause I loved me some Diff’rent Strokes back in the 80s. Anyway, it didn’t surprise me that people turned out in droves. When Sandra Bullock started winning awards, I finally broke down and saw it. And I’ll admit that it was better than I thought it would be. I give credit to writer/director John Lee Hancock for showing restraint with a story that could so easily have gone down the road I was expecting based on those trailers. But that said, there is no way this film should be singled out as one of the year’s best. It is a nice, “heartwarming” movie, but completely ordinary. With movies like Where the Wild Things Are, The Road, A Single Man, Fantastic Mr. Fox, The Messenger and In the Loop all in the mix, a nomination for The Blind Side is a joke. Other than that, the list went pretty much as expected. The consensus is that Avatar, The Hurt Locker, Inglourious Basterds, Precious and Up in the Air would have been the five nominees if the category hadn’t been expanded, so it’s interesting that those films’ directors all earned nominations: usually one or two of those people would have missed. James Cameron, Kathryn Bigelow, Quentin Tarantino, Lee Daniels and Jason Reitman is a great list of directors to represent 2009 (he had no chance, but I wish Spike Jonze had been recognized for Where the Wild Things Are). My only other comment here is that as I’ve followed the award season since it began in early December, one of the most pleasant surprises has been how well Inglourious Basterds has done. Christoph Waltz was a shoo-in nominee from the moment the film’s first scene was over, and Tarantino’s screenplay was also a safe bet early on. But I honestly didn’t expect Tarantino’s gonzo revisionist take on World War II to fare so well across the board – critics’s awards, guild awards, ten best lists, etc. I would never have predicted it, but I’m happy that it came to pass, earning QT his second nominations as both director and screenwriter. Bravo. No surprises here. Nice to see a young up-and-comer like Jeremy Renner hang in there with the big boys. He impressed me in North Country and The Assassination of Jesse James By the Coward Robert Ford, so I’m happy for him and the the opportunities that are sure to come his way as a result of this film. I was so excited about him in this role. Freeman is one of my favorites, and the thought of him playing Nelson Mandela was full of such promise. It’s too bad he blew it on this movie. It’s not that Invictus is bad or that Freeman isn’t good in it. It’s just…this is basically a sports underdog movie. It’s Hoosiers. Remember the Titans. Hell, it’s Major League. It’s the familiar story of a sports team rising above low expectations to win big, and maybe learning some important life lessons along the way. There’s nothing wrong with that per se, but here you have one of the great actors of our time playing one of the great lives of our time, and this is the story he chooses to tell? Freeman does well, but the script doesn’t allow him to dig into the character at all. There are a few moments that hint at what he could have done and where he could have gone had he chosen to do a film that was really about Mandela. But this one – he’s hardly even in the second half/last third of the movie. There’s so little depth for him to play that the film wound up being a pretty big disappointment for me. Freeman delivers as best he can with what’s there, but when you think about how much more he could have done? It makes me sad to say so, but I don’t think he should have been nominated. 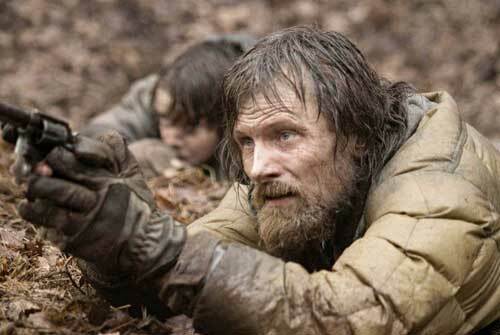 Viggo Mortensen (The Road), Matt Damon (The Informant! ), Ben Foster (The Messenger), Joaquin Phoenix (Two Lovers) and Sam Rockwell (Moon) all had the chance to do much more in their films than Freeman got to do in Invictus. I wish that Academy members had recognized one of them instead of doing the obvious thing and nominating Freeman for a performance that, through no fault of his own, failed to meet expectations. Sandra Bullock’s nomination was no surprise by this point in the season, but it shocks me that she has moved up to take frontrunner status alongside Meryl Streep. She just doesn’t belong here. I’ve always liked Sandra Bullock; she has great comedic timing and her small role in Crash proved that she could handle good drama. But she has chosen bad movies almost exclusively throughout her career; it’s almost like a gift she has. The Blind Side is better than most of the films on her resume, but there is nothing about this performance that calls for award talk. Bullock can do sassy, she can do tough, she can do sweet – these are not stretches for her, nor does this particular character leap off the screen. I enjoyed her, but at the end of the day it was Erin Brockovich Lite. So what is this nomination for? Is it for finally picking a decent movie? For having a good year? Okay, I get that between the huge box office success of this film and last summer’s The Proposal, Bullock is having a Moment (though everyone apparently chose to ignore that her third film – All About Steve – was widely considered one of the year’s worst). But does making two adequate movies that become commercial hits merit an Oscar nomination? No, especially not when Saoirse Ronan (The Lovely Bones), Emily Blunt (The Young Victoria) and Abbie Cornish (Bright Star) are sitting the race out. Does it merit a Golden Globe win over Precious’ Gabourey Sidibe? No way. A SAG award over Sidibe and Meryl Streep? Seriously, no way. This performance isn’t in the same league as her competition. Sorry Sandra. I can only hope the voters come to their senses by the time they mark their ballots. Matt Damon has proven to be a great and versatile actor, and it’s surprising that this nomination is his first since Good Will Hunting. But it’s like Academy members just filled it out on auto-pilot. “Hmm, Clint Eastwood movie, Morgan as Mandela, important subject matter, scene where he gives an inspirational speech…I think by some Academy bylaw we’re required to nominate this.” Snore. Like Freeman, Damon is good in the film, don’t get me wrong. But also like Freeman, the role doesn’t ask much of him. And like Bullock, Damon finds himself in this race without really doing anything that special. Matt Damon did give a nomination-worthy performance this year; it just wasn’t in this movie. I really don’t get it. There had to be a significant number of people who listed Damon as their first choice – their favorite Supporting Actor of the year – in order for him to score a nomination. I can’t fathom that, even in such an unusually weak year for this category. The rest of it looks good. It’s nice to see Christopher Plummer earn his first nomination after so many years of excellent work. Stanley Tucci, too — he doesn’t have Plummer’s years under his belt, but he’s been playing the game well for a long time. And it’s great to see Harrelson back in the field. He’s done some terrific work these last several years. Too bad they’re all gonna lose to Christoph Waltz. Last year’s winner Penelope Cruz scored her second consecutive nomination, and while I would have singled out Marion Cotillard from Nine‘s ensemble, Cruz was good and probably caught voters’ attention with one of the film’s more comedic performances, as well as general hotness. I think Maggie Gyllenhaal benefited from an all-around appreciation for Crazy Heart. There were stronger performances to choose from – I’d have gone with The Messenger’s Samantha Morton – and Gyllenhaal’s been overlooked for performances more interesting than this one, but I can’t begrudge her finally getting some recognition. And seeing Up in the Air’s ladies is no surprise; each is deserving. Too bad they’re all gonna lose to Mo’Nique. I thought The Messenger‘s chances were slim given that the Writer’s Guild failed to nominate it even when other sure-thing contenders like Up and Basterds were ruled ineligible, so kudos to the Academy’s writer’s branch for acknowledging this small gem. Major kudos for including In the Loop in the adapted race. Without a doubt this was one of the best scripts of the year – smart, tight, topical and hilarious. I thought the movie might get overshadowed by something higher profile, but it totally deserves the nomination. Rent this movie NOW. What the @#%! is The Secret of Kells? Whatever it is, I was just glad that for the first time since 2002 there were enough eligible films to have five nominees instead of three. It’s a testament to how much great animation there is these days that any one of these would totally deserve the prize….this Kells thing notwithstanding, since I haven’t seen it. The nomination for Harry Potter and the Half-Blood Prince took a lot of the pundits by surprise, but they must have forgotten how beautifully photographed the film is and how frequently the cinematography was mentioned in reviews. Great to see it recognized. Another snub for The Road. Dirt, grime and muck may never have been so artfully, beautifully applied as they were in this movie. I have no idea what Il Divo is, so no comment on that one, but The Young Victoria?! Over The Road?!? Are you kidding me?? For what?? I can’t wait for this category to come up on the show so I can see exactly what sketches, behind the scenes footage and finished clip will highlight how this could possibly have taken a spot. Ed Helms’ missing tooth in The Hangover would have been more nomination-worthy than anything I can think of in The Young Victoria. And Star Trek was nominated? Maybe I’m forgetting something, but that seems to be a nomination for pointy ears and some tattoos on Eric Bana’s head. Big deal. I suppose someone else would look at The Road and say, “It’s just dirt. Big deal.” But of course, they would be wrong. How about something for Zombieland or District 9 in lieu of Trek and Victoria? As there were no other huge surprises or snubs like last year’s Dark Knight/Bruce Springsteen omissions, that’s all I really have to say about the nominees until it’s time to predict the winners in a few weeks. Prepare to be schooled…in boredom and obsessive movie awards analysis.